This can't miss, two day auction features our Sporting and Collector sale on March 14th and our Fine Firearms sales sale on March 15th. James D. Julia’s first Firearms Auction of the year should be another humdinger. Extraordinary arms and fabulous old time collections interspersed with some truly spectacular rarities put this sale value at $15-18 million dollars. Monday, March 14th, will begin with Julia’s new Sporting & Collector Firearms Session. The first Sporting & Collector session premiered with Julia’s October 2015 sale. The special session was developed by the Julia Company to specifically serve clients with more moderately priced firearms. Over the years, Julia’s Auctions have focused on and specialized in rare, historic and expensive firearms. For many years now, Julia’s has been the go-to auction house for high-end, expensive firearms. In fact, no other auction house in the world handles more high-end expensive guns than Julia’s. The Sporting & Collector session now includes more moderately priced guns, with average sale values in the range of $2,000-8,000. The first October sale was a great success and the March sale will surely be a repeat of the fall auction. Monday’s sale will include the Estate Collection of well-known Bill Stewart of Texas. His rare Smith & Wesson #1 Volcanic, in good to very good condition, is estimated at $7,500-12,500. His rare Colt Second Model Dragoon with prototype or experimental back strap slot for stock carries a presale estimate of $10,000-20,000. 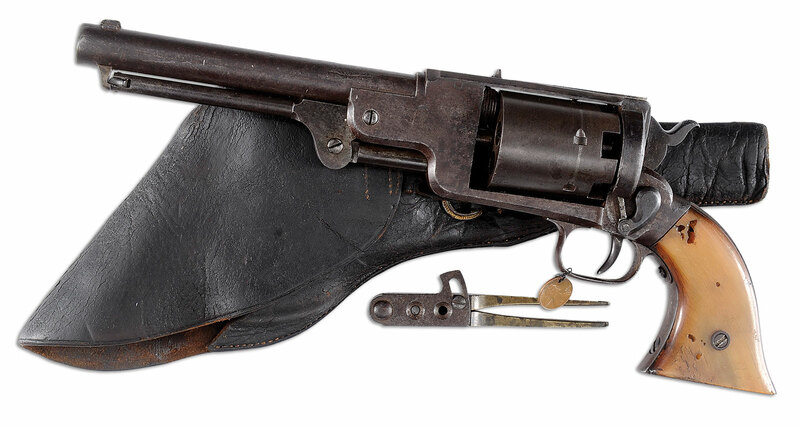 His very rare Winchester Model 73 Saddle ring Carbine with socket bayonet carries a presale estimate of $3,000-5,000. 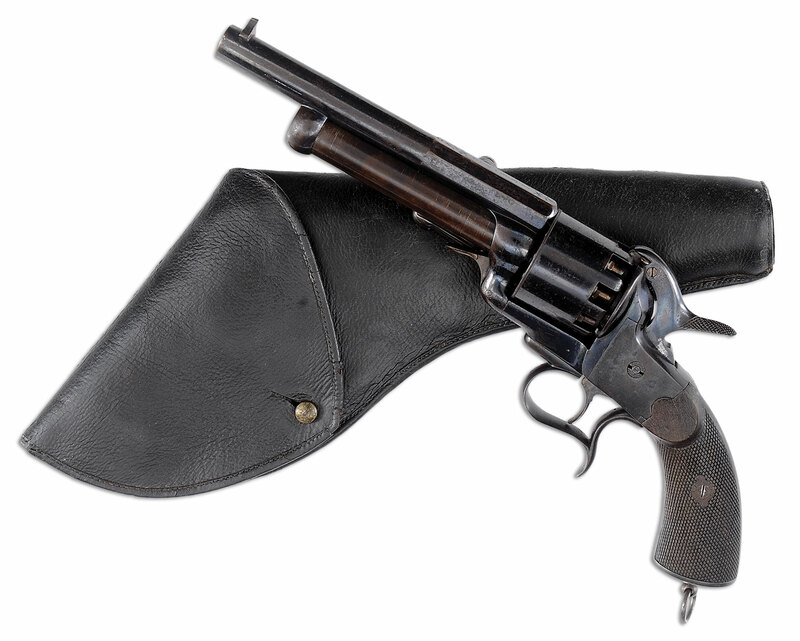 His historic Winchester Model 86, known as the “Murder Steer Gun,” once belonged to Private Jim Putnam of Company D of the Frontier Battalion Texas Rangers (1890-1893) and is estimated at $10,000-20,000. From the Collection of Joel Hankinson is an extremely fine Colt SA Army Artillery, one of the finest known, estimated at $12,000-15,000. The Brad Shepherd Collection of engraved and collectable Colts is also in this auction. His incredible pair of Colt Second Generation SAs engraved by Jerry Harper is estimated at $8,000-15,000. The Dr. Robert G. Cox Estate Collection features a large offering of fine Colt New Line, House, Single Actions, and others. His pair of cased factory engraved New Line revolvers with pearl grips is estimated at $3,000-5,000. And Dr. Cox’s factory engraved Colt Open Top with Wexell & DeGress grips in a burlwood case comes estimated at $2,500-3,500. The Carmen Gianforte Collection of Reid Knuckle Dusters is believed to be the largest single collection of its type in the world. Featured in this sale will be his very rare large frame .41 ca. Knuckle Duster in very good to fine condition and estimated at $8,000-12,000. An extremely rare and important Reid “My Friend” presented to J.M. Egnor, the only known factory inscribed Knuckle Duster, is also in excellent condition with a presale estimate of $2,250-3,250. Fine and moderately priced sporting arms are also included, including a number of Parkers. A Parker VH 28 ga., nicely restored, is estimated at $8,000-12,000. An exceptionally fine high original condition Lefever GE grade 20 ga. carries a presale estimate of $4,000-6,000. An extremely fine Winchester Model 42 Field Grade with its original box and hangtags in extremely fine condition is estimated at $3,500-5,500. From the Timothy Scott Collection of Sporting Arms is a beautiful engraved Krieghoff Ulm Brevis Double Rifle with extra combo barrels and two scopes. This excellent cased set carries a reasonable $4,000-6,000 estimate. A rare Nazi M-1940 Double Decal SS WWII helmet is estimated at $2,000-4,000. An extraordinary Springfield Armorysenal Model 1922 Heavy Barrel Match Rifle carries a $15,000-25,000 estimate. Things should really heat up on Tuesday, March 15th, which features perhaps the greatest selection of high-end, expensive guns that have come to market in quite a few years now. This session will include treasures from the esteemed Collection of Paul Tudor Jones II, including his rare President Harrison shotgun which should prove to be the most significant Lefever extant. This is a Lefever Optimist 12 ga. The Optimus Grade is the highest quality shotgun ever produced by the Lefever Arms Co and this very rare treasure is estimated at $75,000-125,000. Presidential guns from the south of the United States are also represented by his extraordinarily rare Nimschke engraved and ivory stocked Model 1866 carbine with a relief carved Mexican eagle. The gun was purportedly made for Emperor Maximilian and at one time in the collection of his Excellency Porfirio Diaz, President of Mexico. This superb treasure carries a $150,000-250,000 estimate. The Tudor Jones Collection also includes two very rare Winchesters. One is an 1876 1 of 100, in fine condition, it carries a presale estimate of $175,000-275,000. Also from the Jones Collection is the 1 of 1000 Model 1873 in fine condition. It too is estimated at $175,000-275,000. Probably the highlight of the antique Colt offering has to be the extraordinary, rare cased consecutive numbered pair of exhibition quality Model 1860 Army’s presented to General Joseph Hawley. These fabulously engraved guns with rare ebony stocks were virtually never fired and in almost new condition. The guns have formerly been in numerous renowned collections and now come as part of the Tudor Jones Collection. These extraordinary masterpieces are estimated at $250,000-350,000. The Tudor Jones Collection also features a number of fine and rare Bowie knives. Notable is an early 19th century American Bowie knife attributed to Samuel Bell of San Antonio, Texas complete with its original sheath and inlaid 5-point stars, it is in fine to very fine condition. It is estimated at $50,000-100,000. His massive and extremely rare circa 1835 Broomhead & Thomas “Arkansas Toothpick” is also in fine excellent condition and estimated at $40,000-60,000. From a prominent private collection is a rare cased Colt Patterson #3 belt model with extraordinarily rare 12 inch barrel. This gun, formerly owned by the Duke of Orleans was sold in the late 20th century when the effects of the last French royal family were dispersed. The Duke of Orleans was the son of King Louis Philip I and heir to the French throne. His extraordinary Paterson in superb and outstanding condition is estimated at $600,000-750,000. From the same collection comes another superb Paterson, an extremely rare #5 Holster Model Texas Paterson complete with all accessories. This set, in extremely fine condition, is estimated at $300,000-600,000. This sale will include various Volcanic arms. 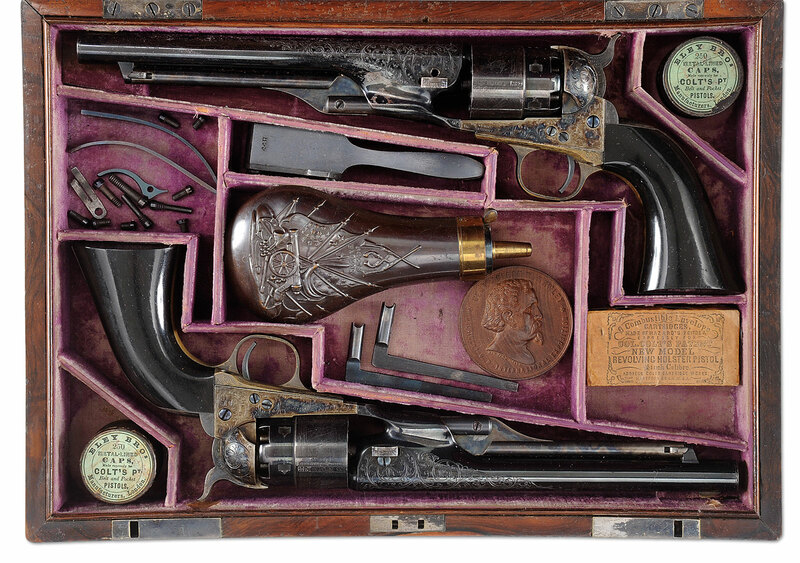 Most notable is a spectacular #2 Navy Pistol, once in Samuel Colt’s personal collection. In extremely fine plus condition, it is estimated at $75,000-85,000. An extremely beautiful Winchester Model 1894 engraved with gold inlay, John Ulrich signed, is in exceptionally fine condition, this beautiful gun with engraved panels depicting North American game is estimated at $55,000-85,000. 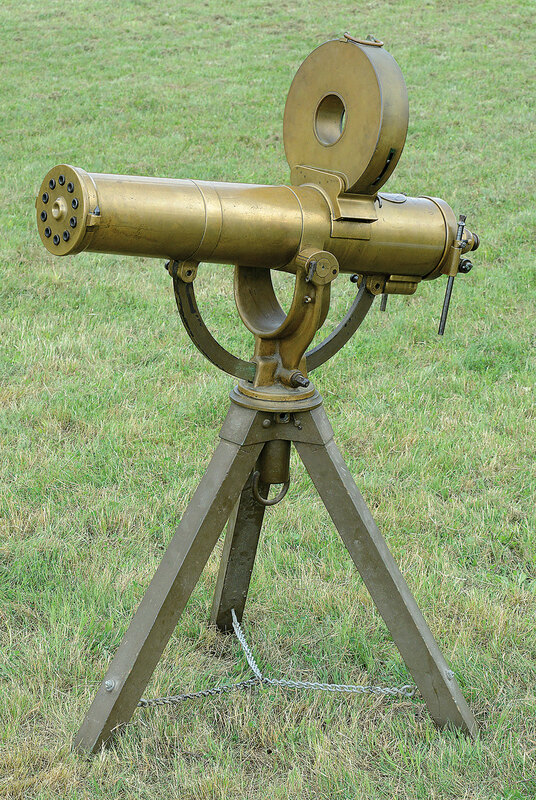 The sale also includes a rare Colt Model 1883 US Navy Gatling Gun on a tripod, in very fine condition and in cal. 45/70. It is estimated at $150,000-250,000. Because of its smaller size, this model of Gatling gun has long been a favorite with collectors. This sale is extremely strong in quality Colt revolvers and certainly the finest cartridge Colt is a magnificent factory engraved SAA etched barrel Frontier Six-shooter with pearl grips, shipped to Charles Hummel & Sons, San Antonio, Texas in 1885. This black powder gun includes the original holster and belt that were purchased at the time. It is in very fine condition and estimated at $100,000-125,000. In 2009, Julia’s sold the engraved, gold inlay Cowboy Special SA that at one time was owned by the Sears & Roebuck, Co. The gun was part of the Dr. Joseph Murphy Collection and at one time belonged to the famous crooner, Mel Torme. The gun brought an unbelievable $750,000. 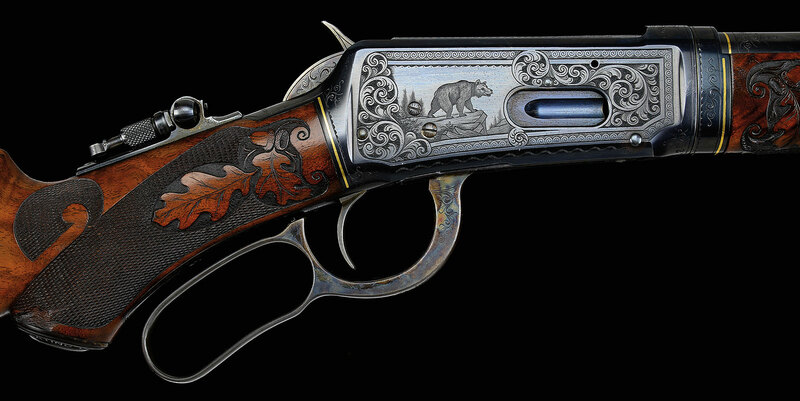 This sale includes an exquisite copy of this same gun by Master engraver, Dennis Kies. It comes from the Collection of Brad Shepherd and it estimated at $15,000-25,000. Numerous superb Percussion Colts will be offered in this sale, many of which have come from the outstanding Collection of Steve Ardia. 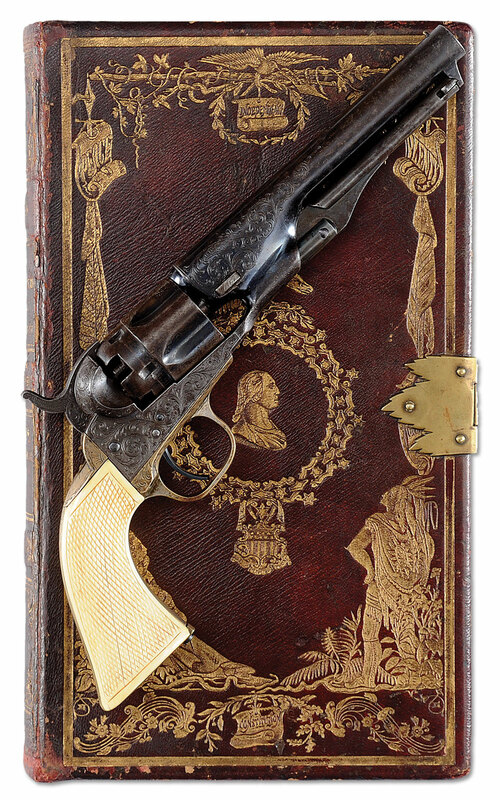 His extraordinarily rare engraved Colt Model 1862 with carved ivory grips comes with its original book bound casings. These bindings are literally in the form of a book and look very much like a book and are exceedingly rare. The gun is in outstanding condition and is estimated at $75,000-110,000. 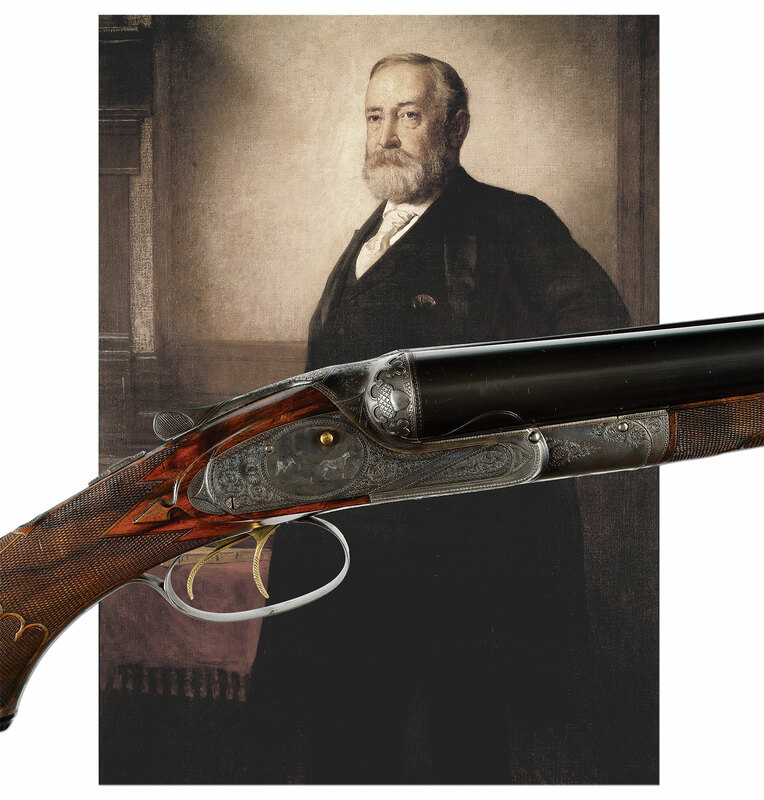 Another highlight of the Ardia Collection is his cased Gustav Young engraved Model 1851 Navy with ivory grips. In outstanding condition, it is estimated at $60,000-80,000. Also from the Ardia Collection is the rare and extremely fine Civilian Model 1860 Army with matching shoulder stock inscribed to Samuel Bowles for use during his remarkable 1865 voyage to the West. His adventure into the Rocky Mountains and onto the Pacific states was documented in the book, Across the Continent, which was published in 1865. This rare Colt in extremely fine condition is estimated at $40,000-50,000. Secessionist pistols are another item strongly represented in this sale. In fact, the Don and Kathlee Bryan Collection of Confederate Revolvers is considered to be the finest of its type in existence. Mr. Bryan’s focus throughout his lifetime has been on quality and rarity. The majority of the guns in their collection are either the finest examples known or in some cases the only known to exist. His exceedingly rare Columbus Confederate revolver is one of only three specimens known to survive; this being the finest and estimated at $150,000-200,000. His LeMat SN# 8, the personal side arm of Gen. P. G. T. Beauregard (who had a vested interest in the LeMat manufacturing firm), is not only in extraordinary condition but is believed to be probably one of the finest condition Confederate revolvers known. This truly spectacular gun replete with a holster is estimated at $200,000-300,000. The Bryan’s Collection of Texas Confederate Revolvers is the most complete known and includes the only known surviving Sisterdale Texas Dragoon Army Revolver with its original horn grips, it is estimated at $150,000-250,000. Another great rarity from the Bryan Collection is their Texas L.E. Tucker Lancaster, Texas Confederate Navy Revolver. It is one of only two known examples, this being the finest example known and estimated at $150,000-250,000. From the Estate Collection of well-known collector, John Ashworth, is an exceptional and unique massive Memphis Novelty Works Confederate “Floating Cs” Clip Point Bowie Knife, in fine excellent overall condition, estimated at $30,000-40,000. The sale is rich in quality Civil War items. A rare fine Civil War Model 1861 Parrott Rifle Cannon made for the State of New York is believed to have been used by the New York Light Artillery at the Battle of Gettysburg in the wheat field. In very good condition, retaining its original iron, it is estimated at $40,000-65,000. Quality early arms include a very fine cased pair of James Haslett (Baltimore) saw-handled flintlock dueling pistols, estimated at $30,000-55,000. From the Spiropoulos Estate of Nova Scotia comes a fabulous cased Manton marked percussion Dueling/Target/Holster ensemble in fine original condition estimated at $18,000-25,000. An important and historic cased pair of gold inlaid Maurer pinfire revolvers bearing the Serbian coat of arms ca. 1860 are estimated at $15,000-25,000. Two fabulous early European high-art examples by the illustrious Maucher family from the mid-17th century, including a superb ivory decorated flintlock pistol and an equally magnificent ornately carved Wheelock rifle are each estimated at $60,000-80,000. In recent years, Julia’s has become the dominant force in the disposition of Best Quality Sporting Arms at auction. Standouts in this sale include quite possibly the Finest Pair of “Golden Age” Purdey .410 ga extra- finish Kell engraved game guns extant at only $150,000-250,000. The lifelong collection of Herb Hyatt features rare and exceptional British guns including a very fine Purdey O/U 12 ga game gun with extra barrels at $45,000-55,000 and a fabulous Early Boss O/U 12 ga heavy game gun with extra barrels at $50,000-80,000. A stupendous private collection of English Big Bore Stopping Rifles features many examples from the Nizam of Hyderabad’s personal armory and obtained directly from Holland & Holland’s Library Collection. Nizam rifles include a colossal cased deluxe engraved 4-Bore in spectacular original condition offered at a very conservative $80,000-120,000 and an awesome gold encrusted 10-Bore spectacularly cased with ivory accouterments at $65,000-95,000. Other rare rifles include a supremely rare (1 of 37) W.J. Jeffery Snap Action .600NE in immaculate original condition at $80,000-120,000. Continental sporting guns include fine examples from the Koilakos collection of Athens, Greece such as a fabulous trio of Ivo Fabbri Majestic 12 ga O/U game guns offered at $35,000-55,000 apiece and a fine assortment of German multi- barrel sporting guns include a svelte Nazi-era lightweight side plated ”Dural Vierling” by Strempel of Suhl at $12,500-17,500. On behalf of the German Gun Collector’s Association, Julia’s will be auctioning off a wonderful contemporary flintlock Jaeger rifle made by some of Germany and the U.S.’s finest craftsmen – all proceeds will benefit the Arms Museum of Suhl Germany for future acquisitions. Other fine guns include a fantastic and rare L.C. Smith “All Options” Premier Grade 12 ga Trap gun at $50,000-70,000. Small bore Parker devotees will relish an extremely fine GHE grade 28 gauge at $22,500-37,500 and many .410s including an extraordinary VHE with hang tags estimated at only $20,000-30,000. Astute Winchester collectors will recognize the value of a fabulous ‘50s vintage Model 21 16ga 2-barrel set with factory #6 engraving at only $25,000-40,000.The final session of the Rod Fuller Estate Collection and select others will include fine Belgian Brownings such as highly adorned Olympian grade rifles and Midas grade shotguns in various configurations. Military and Class 3 weaponry close out the Day Two Session with the final installment of items from the Dr. Geoff Sturgess Collection of Switzerland and include an outstanding Mauser c96 Flatside Commercial Carbine w/ 12” bbl. at $12,000-20,000, a spectacular 1904 Dutch Trials Prototype Luger at $15,000-18,000 and a museum quality Haenel-Roth 1899 self-loading rifle for $10,000-15,000. For the collector of important and historic machine guns, the lineup includes an incredibly rare German ZK-383 sub-machine gun enticingly estimated at $25,000-35,000, a fabulous U.S. marked Browning Water-Cooled .50 caliber machine gun on “Tora-Tora” mount formerly in the Evergreen Museum Collection also at $25,000-35,000, and a super rare Polish MFG R.K.M. Browning WZ. 28 at $20,000-30,000. The sale is documented in two Lavish, full-color auction catalogs. They are $39 each or both for $75. Catalog 1 includes all items from The Sporting and Collector Firearms Auction and Catalog 2 includes all items from the Fine Firearms Auction. James D. Julia, Inc., one of the top ten antique auction houses in the nation, is headquartered in Fairfield, Maine. The company also has an office in Boston, Massachusetts. In business for over 40 years, the company conducts high-end antique, collectible, and decorative arts auctions throughout the year. Julia’s routinely establishes new world records through its sales events. Julia’s has three key divisions, including rare firearms and militaria; fine and Asian art and antiques; and lamps, glass and fine jewelry. Each division is internationally recognized and respected. For more information on James D. Julia, Inc. and the company’s March 14-15, 2016 Firearms Auction, please visit http://jamesdjulia.com/division/gun/ . Lot 1748, a rare and exquisite factory engraved and gold plated Smith & Wesson 38 Hand Ejector 1st Model DA Revolver for the Pan-American Expo, 1901. Estimate: $4K-7K. Lot 2032, an extraordinarily rare factory engraved, signed John Ulrich, gold inlay Model 1894 in exceptionally fine condition. Estimate: $55K-85K. Lot 2065, a rare Colt Model 1883 US Navy Gatling Gun on tripod in Cal. 45/70. Very fine condition. Estimate: $150K-250K. Lot 2109A, a rare engraved Colt Model 1862 Police with exceedingly rare Bookcase binding. In outstanding condition. Estimate: $75K-110K. Lot 2149, an extraordinarily rare and desirable cased consecutive numbered pair of exhibition quality Colt M1860 Armys formerly belonging to Gen. Joseph Hawley. Estimate: $250K-350K. Lot 2198, a LeMat SN# 8, owned by Gen. Beauregard. Considered to be one of the finest condition Confederate revolvers known of any manufacturer. Estimate: $200K-300K. Lot 2203, the only surviving specimen of a “Sisterdale Texas” Dragoon Army Revolver. It is complete with original horn grips. Estimate: $150K-250K. 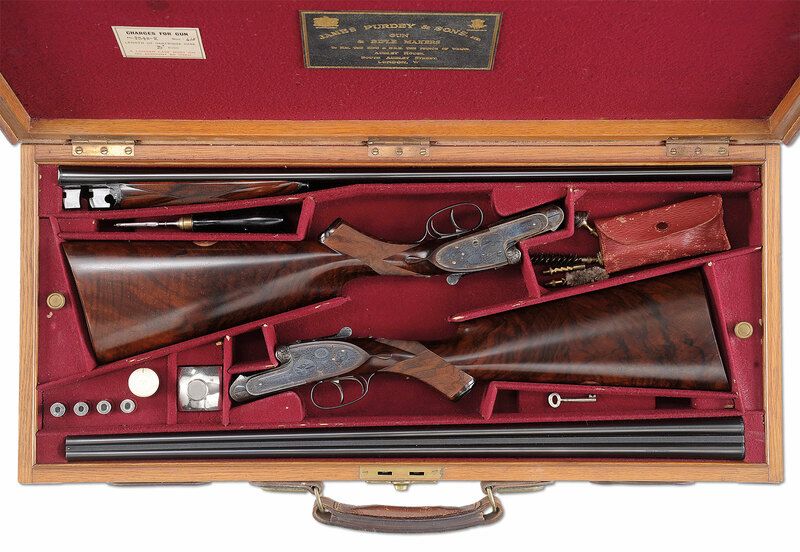 Lot 2291, a Golden Age Pair of Purdey Best .410 Game Guns, Extra Finish by Kell. Two of Six .410s made before WWII. Estimate: $150K-250K. Lot 2355, a fine gold inlaid ten bore Holland & Holland hammer rifle made for the Nizam of Hyderabad with original case and spectacular new display case with ivory accessories. Estimate: $65K-95K. Lot 2429, a Lefever "Optimus" quality shotgun, presented to Benjamin Harrison for his "Protection to American Industry." Probably the most important 19th century American shotgun. Estimate: $75K-125K. 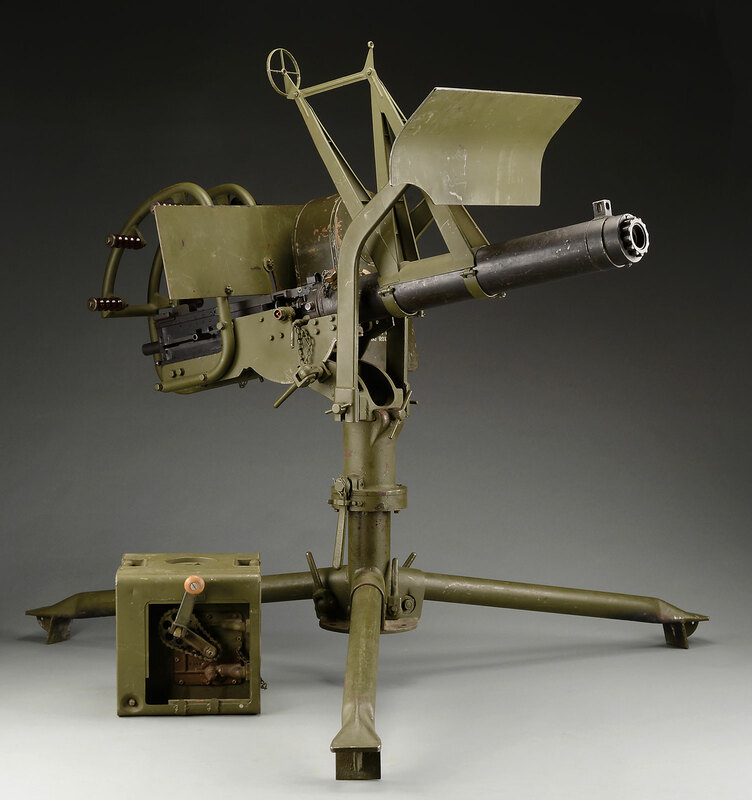 Lot 2682, an impressive WW-II Era GM-Frigidaire Browning .50 cal Water Cooled Machine Gun on "Tora-Tora" Mount. Formerly on loan to Evergreen Aviation & Space Museum. Estimate: $25K-35K.